I was shocked and horrified to read Flanagan’s article. It was amazing that she could accuse us (as educators) of wishing illiteracy and back-breaking-nearly-slave-labor upon our students. Last time I checked, there was nothing wrong with trying to teach people where their food comes from – and how it gets to their plates. Oh yeah – and it DOES make a difference in our children’s eating habits (and in case she forgot, we are in the midst of an insane obesity epidemic.) ‘nough said. I have not read this article and had not heard about this controversy, so thank you for writing about it. I believe a program like the one you describe is very worthwhile. If something similar had been available in my town, I would have signed up my children. I read the article after your last post that mentioned it. I’m glad you’ve written a rebuttal from the coal face. You sum up her (thin) argument and all its holes well. I’d love to see The Atlantic copy editors do as well next time! I can’t wait to see the letters to the editor, Gretchen. Folks got pretty fired up about this piece. It was so satisfying to read your post! Thank you so much for your rebuttal – I appreciate how thoroughly you dissect her thin argument and at the same time, tell us what you’ve seen and what your experience has been. Wherever there’s a controversy like this, you can usually find Caitlin Flanagan or Katie Roiphe firing the salvos. Nice reply! I too was just seething when I read it and kinda thought it must be a joke. She seemed so very narrow-minded and uninformed. Oh well, them’s the breaks, but so glad you and so many others are rebutting her. Congratulations to you on a most wonderful and passionate post! How totally ridiculous Flanagan is to make these claims. You’re so right – it’s so much more than just about the food that enriches these kids’ lives. And what in the world is wrong with teaching cooperation, support, hard work, health and self-worthiness through food? I think that is what this article was about, most are irritated by the tone of the article itself, but isn’t this above a valid point? You do raise a valid point. But any parent whose child attends MLK Middle School would laugh if someone suggested that the Edible Schoolyard “is the center of everything” at that school. It is yet another absurd and inaccurate characterization of what’s going on there. And if Ms. Flanagan had bothered to stop by, instead of phoning it in, she would have learned that herself. There are some many interdisciplinary ways to incorporate learning into a program like Edible Education. I would have loved something like this as a kid, because unfortunately (like many of us) I grew up on a diet of processed foods and didn’t really learn how to cook or appreciate fresh produce until I was out of college. Nicely said, Susan. Thanks for that. Full disclosure: No money or food changed hands for any of this coverage. This story has just generated a huge amount of interest. I don’t understand why snark sells or why people want to read critiques and failures more than success. Thanks for debunking some of it! Thank you for addressing and rebutting yet another of Flanagan’s ridiculosities. She is a purposefully inflammatory attention seeker and she’s boring. As a Los Angeles ex-inner city teacher you have given me food for thought in terms of volunteerism. Are there any programs in LA like Edible Schoolyard? You’re not alone in your thinking. As for school gardens in L.A., check out a great roundup of programs around the country by Adriana Velez for Civil Eats. She includes the 24th Street Schoolyard Garden in an area of L.A. that used to be a food desert. Apparently the thriving edible garden has an outdoor kitchen with a pitfire pizza oven. I found out about the article via the Purple Asparagus January newsletter and was just dumbfounded by the snarky attitude of the writer. I’ve lived and gone to school in Berkeley and it really would have behooved Ms. Flanagan to visit the site she so distains before writing about it. 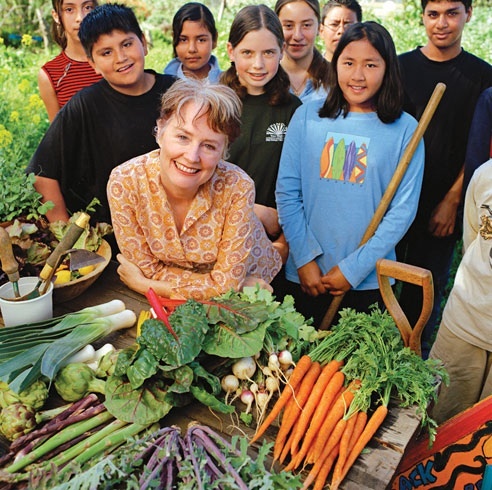 One key thing she missed about Alice Waters–the chef is also a Montessori trained teacher so there is that aspect behind the garden–hands on practical education outside the classroom–life skills that can enhance any traditional curriculum. Glad you found your way here. You raise a good point about Alice’s Montessori teaching background and that hands-on approach is evident in every aspect of the Edible Schoolyard program. It seems that Ms. Flanagan has appointed herself as a spokesperson for the dispossessed. Perhaps she should let them speak for themselves. My father was five when his farming family lost their land in the Great Depression; they became migrant workers and sharecroppers– the poorest of the poor in rural Georgia. By age six, he would work in the fields every day after school until sundown. Some years later, he went to college with the aid of the GI bill and become a very successful systems analyst and inventor — someone that Flanagan might think would never want to lift another hoe again as long as he lived. But actually, one of the great pleasures of my father’s life (besides his family) was his enormous organic garden. He grew 20 types of vegetables, planted apple trees, strawberries, and blueberry bushes, and canned the surplus for the winter. He passed on that love of gardening to us, and he would have loved the Edible Schoolyard. How I wish he were here to write a response! Thank you for such a personal, poignant, and on point response to Ms. Flanagan’s account. You vividly make the case for your father’s enduring connection to the land. I’m sure he would be proud of you.